Okay, why does this always happen? Our annual softball tournament had to fall on the hottest day of the year so far. Not only that, the league decided to schedule 4 games in a row without breaks. Luckily I brought plenty of Gatorade and had picked up some Banh Mi earlier in the morning. The day started off quite well with a convincing win in our first game. Then we proceeded to lose our next 2. The third one was particularly troubling for 2 reasons. First, I was almost knocked into the next area code when I collided with an opposing player at first base. I got a bloody nose for my troubles. Then, on an obvious out at 3rd base, the ump inexplicably called the opposition safe. That cost us 2 runs and yup, the game as well. Seems like the ump should've eased up on the cocktails whilst umping. Luckily we were able to squeak out a win in our 4th game to finish 2-2. Thus, by virtue of run-differential by only one run, we made it the next round. Joyous, yet very tired, we all headed back home to shower and re-energize. Don't worry, we were still gonna eat! Therefore, we had to find a place that w as central to everyone. That ended to be Manolis. 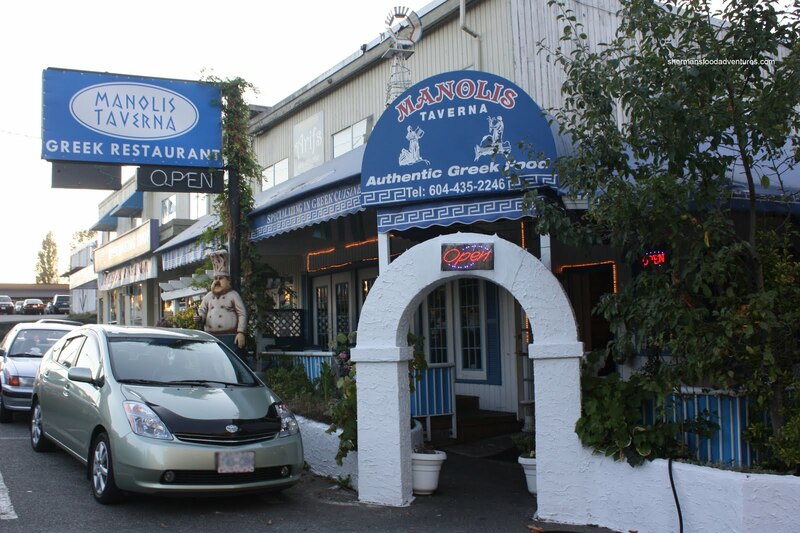 Much like last year at Stella's, Manolis does not have A/C. Being the hottest day of the year so far, we had to rely on ceiling fans. Too bad the fans and restaurant lighting kept going out throughout our meal. Looks like the circuit breaker couldn't take it anymore. Maybe it was suffering from heat exhaustion as well? At first glance, the prices here seem a bit high. However, they currently have a special for $10.99 which gives you a choice of roast lamb, souvlaki or moussaka. 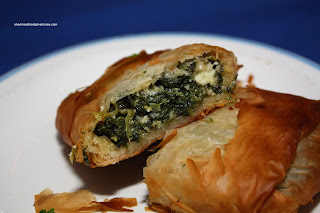 Judes got the Spanakopita as an appy and it was pretty average. Dry and bland. Ketchup and Ranger started with the Saganaki. 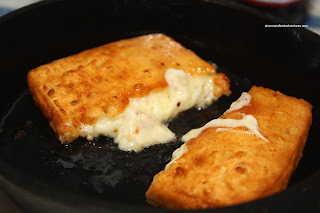 She was a little disappointed with the it since it was a little on the dry side and not as flavourful as she would've liked.. With that said, how can one not like deep fried cheese? Ketchup went for the Chicken Souvlaki while Ranger had the Beef Souvlaki. 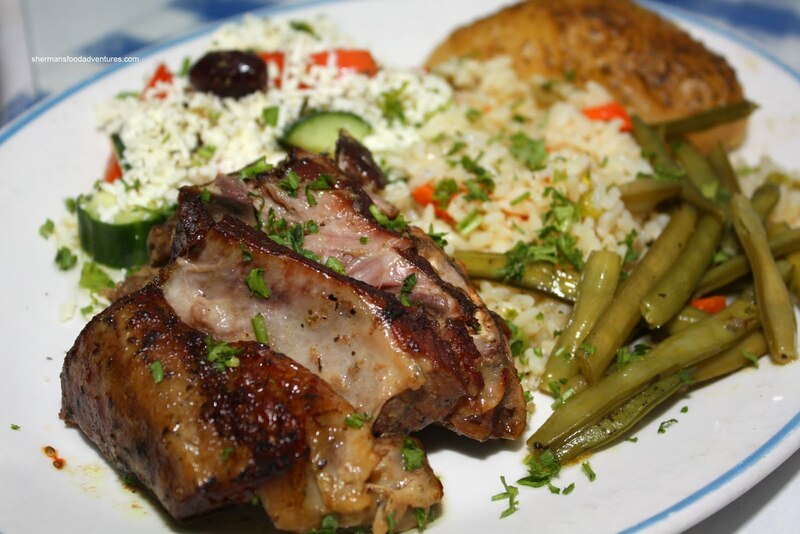 Presented similarly on a bed of rice with lemon potato and Greek Salad, the portion size was indeed very modest. If we had to pay the regular prices, this would be a terrible value. Since Bear and I decided to share the Manolis Platter, I got to sample practically everything that was ordered at the table. Thus, I didn't need to scam samples from everyone. I found both of the souvlakis to be overcooked and dry. Despite this, there was good flavour with a proper amount of seasoning including lemon and garlic. The lemon potatoes had a nice softness to them without being mushy. I would've liked even more lemon though. I was really confused with the rice. Texturally, it was fine (slightly chewy); but it was spicy. Hey, I have nothing wrong with spicy, I like spicy. Yet, it was not what I expected. 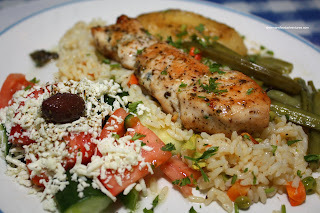 I liked the Greek Salad, it was fresh and only lightly dressed. Boss Woman, Hot Chocolate and Milhouse all had the Roast Lamb and once again, the portion size was very modest. Although the lamb was not incredibly moist, it wasn't dry either. There was some really tender portions mixed in with slightly chewier pieces. That is usually the case with roast lamb anyways. There was a pronounced garlic flavour and for me, that was very good. Judes went for the Prawn & Scallop Souvlaki. The prawns were small and scrawny for her liking and the scallops were a tad overcooked being chewy and a bit hard. She was confused with the rice as well. Spicy rice? Maybe in a Spanish restaurant. She was not that impressed with her meal. 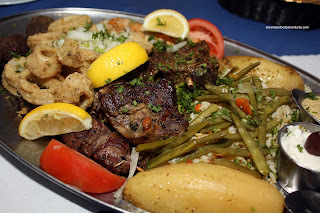 As mentioned, Bear and I shared the Manolis Platter which consists of roast lamb, beef & chicken souvlaki, calamari, keftedes (substitution for dolamathes), lemon potatoes, veggies, rice, tzatziki and humus. For $50.00, there was a fair amount of food; however, the summer specials, being $11.00 each would be a better deal. I liked the Calamari. The squid was tender and well-seasoned. The batter could've been a bit more crisp though. I wasn't a huge fan of the Keftedes. They were dry and bland. It needed a lot of tzatziki to save it. As for the humus, it was quite oily and also lacking in seasoning, although it did have a good amount of garlic. Lack of A/C withstanding, our experience at Manolis was quite underwhelming. If we had to pay the regular menu prices (which Bear & I did), the portion sizes are insufficient. In terms of the food itself, it was mostly below average with a few highlights. 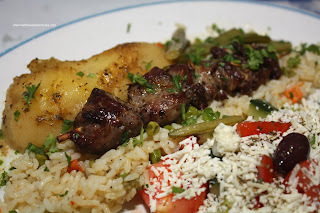 With so many other Greek restaurants around, Manolis would not be high on my list. 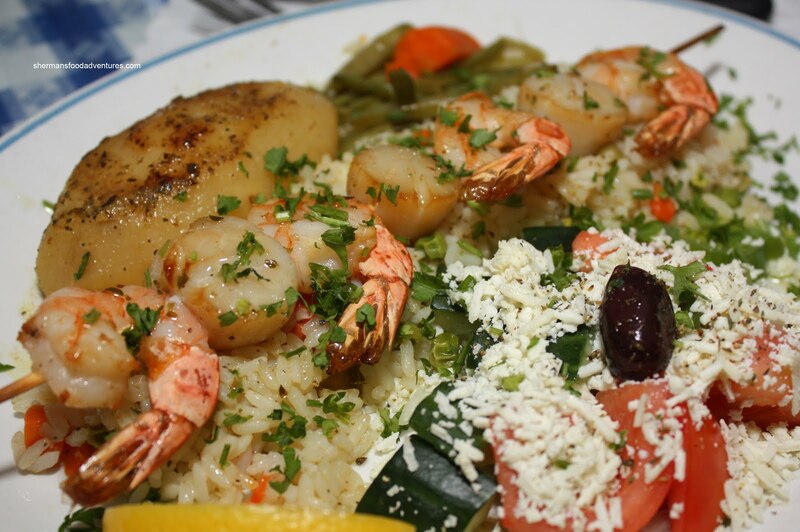 Minoa's would be the best choice in South Burnaby. Ramie's ..... nothing spectacular IMHO, and their prices feel high for what you get. Sfinaki on Hastings @ Gilmore is pretty good. Or Tsolias further west at Nanaimo. There is also Vassilis Souvlaki on Kingsway. I had decent food there a few times.